This twin room features a seating area, an electric kettle and tile/marble floor. This double room features a cable TV, seating area and an electric kettle. This double room has a seating area, air conditioning and an electric kettle. This twin room features a tile/marble floor, an electric kettle and air conditioning. 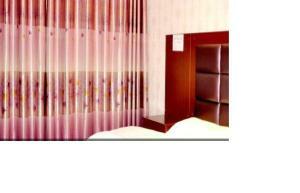 Junhao Business Hotel offers accommodation in Xianyang. The property features free WiFi access and free private parking. Xianyang International Airport is only 7 minutes; drive from the property. It takes 1 hour to Xi'an downtown area by car. Each room at this inn is air conditioned and has a flat-screen TV with cable channels. Certain rooms have a seating area where you can relax. You will find a kettle in the room. All rooms come with a private bathroom. There is a 24-hour front desk at the property. You can also find a tour desk here. Guests are required to show a valid government-issued ID card or passport upon check-in. IMPORTANT: Due to local regulations, Junhao Business Hotel is only able to accept guests who are Chinese nationals. Guests must present a valid PRC Identification Card at check-in. If you are not a Chinese national, please choose another property.